NASHVILLE, Tenn. (November 14, 2016) -With more than one million copies sold, the New York Times bestseller Same Kind of Different As Me, which chronicles the unlikely friendship between author Ron Hall and a homeless man and the book’s co-author Denver Moore, will be adapted for a Paramount Pictures release, in theaters February 3, 2017. To coincide with the film’s release, W Publishing Group (an imprint of Thomas Nelson) will publish a special movie edition including a 16-page color photo insert on January 3, 2017. 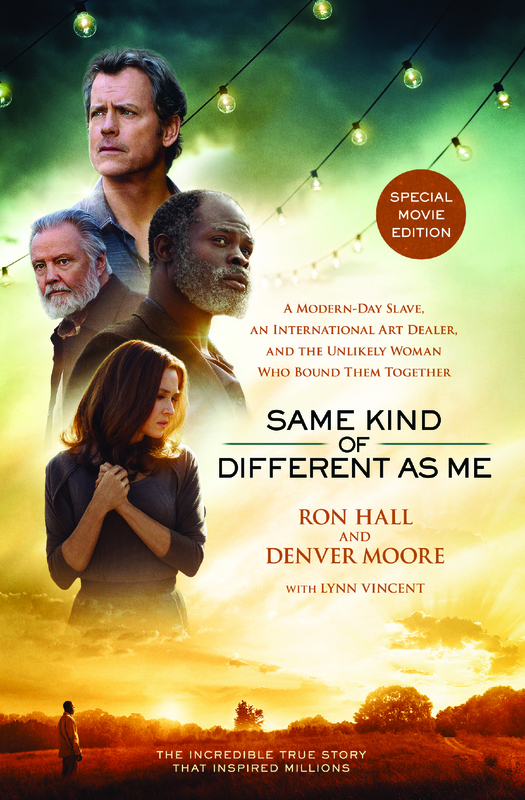 The story about two stubborn angels in Same Kind of Different As Me – Movie Edition is perhaps even more timely today than when the book first released in 2008 as it shares a message of compassion, love, healing and a better way forward in the midst of racial and relational divisiveness. A divisiveness not caused by the skin color, political views, or even homelessness, but by the condition of our hearts – which is something only God can change. Ron Hall was an international art dealer whose long list of regular clients includes many celebrity personalities. He is an MBA graduate of Texas Christian University, New York Times bestselling author of Same Kind Of Different As Me and What Difference Do It Make? and champion for America’s homeless. Ron now divides his time between Dallas, New York, and his Brazos River ranch near Fort Worth as he continues to speak across the country to raise awareness and funds for homeless missions. Denver Moore, author of Same Kind Of Different As Me and What Difference Do It Make?, was born in rural Louisiana in January 1937. He was a homeless drifter until he was sentenced to Louisiana’s Angola Prison, where he resided until 1976. For the next 22 years he was homeless on the streets of Fort Worth, Texas. In 1998, Debbie Hall met him and his life was changed forever. Denver continued to live his life as an artist, public speaker, and volunteer for homeless causes. In 2006, the citizens of Fort Worth honored him as “Philanthropist of the Year” for his work with homeless people at the Union Gospel Mission. On March 31, 2012, the gates of heaven swung open wide for Denver. He was 75 years old when he was reunited with “Miss Debbie” and leaves behind millions of folks forever changed by his testimony. Thomas Nelson, a division of HarperCollins, is a world-leading provider of inspirational content and has been providing readers with quality life-changing product for more than 200 years. The publishing group provides multiple formats of award-winning Bibles, books, gift books, cookbooks, curriculum and digital content, with distribution of its products in more than 100 countries. Thomas Nelson is headquartered in Nashville, TN. For additional information, visit www.thomasnelson.com.